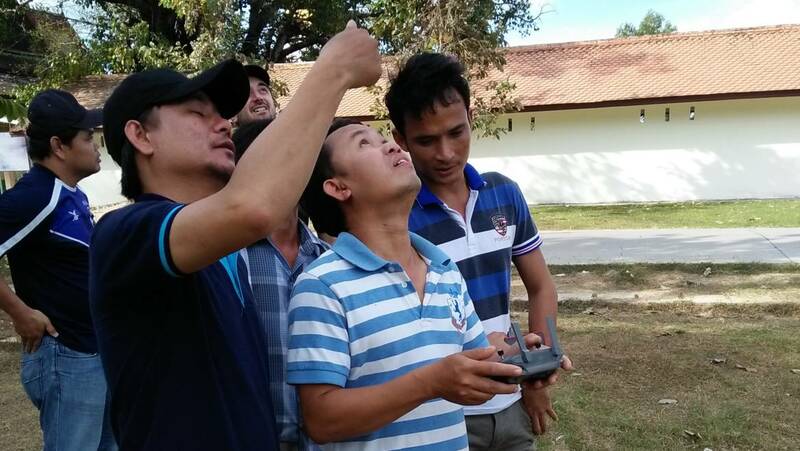 ISEAA and Lao colleagues – Joyce White, Jared Koller, Peter Cobb, Bounheuang Bouasisengpaseuth, and Arnon Pong (Souksamone) – did drone practice and trial flights at Vat Sikhottabong. The next phase is drone mapping for the historic town in the forest around Vat Sikhottabong. The survey team used drones and Emlid Reach RS+ GNSS (Global Navigation Satellite System) receivers to precisely locate points in the main temple complex and surrounding features linked with GPS. Drone pilots, both western and Lao, flew DJI Mavic 2 Pro drones up to 70 meters over the site’s surface, flying back and forth to see every part of the site from multiple angles. Dear ISEAA followers, Bounheuang Bouasisengpaseuth did a fun post showing yesterday's drone practice at Vat Sikhotabong. Jared Koller, Arnon Pong (Souksamone) and others were there. Enjoy! Pong's first trial drone flights at Vat Sikhottabong! !